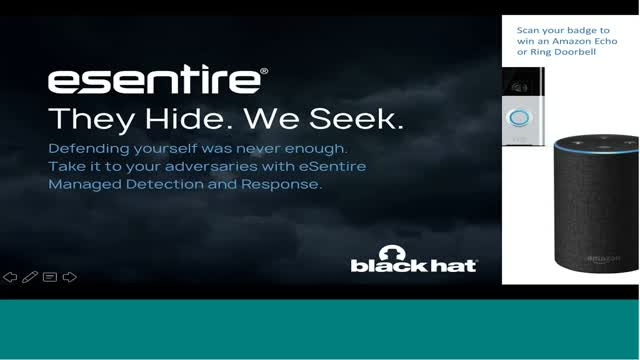 During Mark Sangster’s 10-min in-booth presentation at Black Hat USA 2018, he discusses how the disparity of services across providers can lead to confusion in the market about the key difference between MDR and MSSP, ultimately resulting in a heightened risk for potential clients. As the definition continues to evolve, we believe what distinguishes a true MDR provider from those that just claim to be are key detection and response capabilities. Colin Fernandes, Product Marketing Director, Sumo Logic and Alex Jinivizian, Vice President of Strategy, eSentire. Today’s digital organisations operate on a wide range of modern applications, cloud infrastructures and methodologies for continuous delivery and operations that accumulate and release massive amounts of data. If that data is managed incorrectly, it could allow malicious threats to slip through the cracks and negatively impact the business. Join Sumo Logic and eSentire as they present how the combination of cloud-based SIEM solutions plus Managed Detection and Response provide a broader visibility across the organisation, eliminating common blind spots all too often exploited by adversaries. Endpoints are among the most popular targets for sophisticated threat actors. Hackers know they can bypass traditional antivirus solutions while avoiding detection and establishing control. eSentire’s Annual Threat Report provides an expansive overview of the threat events investigated by the eSentire Security Operations Center (SOC) from 2,000+ proprietary network and host-based detection sensors distributed across the globe. In this webinar, eSentire will discuss the key findings from its 2018 Annual Threat Report, highlight emerging threats expected to be seen in 2019, and provide recommendations on how organizations can prevent their networks from being compromised by common types of attacks. Like recent Cyber targets, Marriott and Quora, Healthcare providers, insurers and med-tech firms present a rich target for cyber criminals, offering lucrative gains. eSentire conducted independent research, interviewing 1,250 senior executives, leaders and security practitioners to understand the risks that face their organizations, and the strategies and investments they are making to protect their businesses. What emerges is a paradox of perceived readiness when it comes to responding to cyberattacks, which is not supported by the underlying data when it comes to spend, security programs, reporting, and attack data from eSentire’s security operations centers. Recent cyber-attacks allow for a prescriptive baseline in order to explore those findings and delve into the conflicting evidence to provide a clear picture of where healthcare security stands, and where it needs to go to meet the threats posed by the cyber criminals actively hunting them. eSentire Managed Detection and Response (MDR) services closely monitor and respond to attacks on your organization. However, as your data expands from on-premises to the cloud or somewhere in between, new blind spots are emerging. Threat actors are taking advantage accomplishing their objectives faster than ever. Traditional SIEMs have proven they are not enough. Today’s hybrid IT environment requires an additional spectrum of visibility with integrated detection and response capabilities to catch the most elusive of threat actors. One of the biggest business risks to the financial services industry is cybercrime, which has prompted global regulators to put a stronger focus on cybersecurity in 2018. This includes the Canadian federal government, who recently announced plans to invest more in cybersecurity. Unfortunately, current Canadian cybersecurity regulations are leaving investment firms exposed to advancing cyber threats. In this talk, we will explore global cyber-attack trends, best practices and proactive measures to reduce your cyber threat profile and mitigate risk to protect your firm today. Risk factors such as third-party access, limited IT and security resources and specific regulated guardrails for cybersecurity policies and procedures have a direct correlation of a company’s susceptibility to a cyber breach. While new vulnerabilities present new vectors to target, attack techniques remain fundamentally the same: discover, analyze, attack and exploit. Assuming attackers will continue to find a way through, the key to reducing risk is understanding how they target and execute their attacks. Join eSentire Penetration Tester, Chuck Ben-Tzur and Cybersecurity Evangelist, Mark Sangster as they share their experience on the current cybersecurity posture and conducting penetration tests to identify vulnerabilities and risk. The New York Department of Financial Services (NYS DFS) recently announced that its scope will now include Health Maintenance Organizations (HMOs) and Continuing Care Retirement Communities (CCRCs). As a result, cybersecurity compliance for these organizations is going to get a lot more complicated. HMOs and CCRCs will not only need to adhere to HIPAA requirements, but also to sections of NYCRR 500, including operating under the shadow of the 72-hour breach notification rules. During this panel webinar session, Mark Sangster, Vice President Strategic Marketing, and Ken Rashbaum, Partner at Barton LLP, will explore the impact of these new regulations on HMOs and CCRCs and lead a Q&A discussion on how you can prepare. One of the biggest business risks to the financial service industry is cybercrime. Cybercriminals are after banking and financial credentials, trading and investor information or strategies, consumer data, business and tax filing, fraudulent redemptions and more. Breaches can result in financial loss, disruption of operation, compromised confidential information and reputational damage. This significant risk has prompted regulators to put a stronger focus on cybersecurity in 2018. In this talk, we will discuss how alternative investment firms can navigate regulations and explore cyber-attack trends, best practices, and proactive measures to reduce your cyber threat profile, mitigate risk, and avoiding regulatory investigations and investor disclosures. C-level executives must consider cyber risk as a core tenant of their responsibilities, as well as their mission to drive sustainable healthcare services. In this talk, we’ll explore attack trends and share best practices and preventative measures to help you reduce risk and avoid investigations. The healthcare industry continues to be one of the most exploited industries. Risk factors such as third party access, high volume of staff-patient interaction and an investment imbalance when it comes to protecting a patient’s health vs. their personal information leaves healthcare organizations susceptible to attack. While new vulnerabilities present new vectors to exploit, attack techniques remain fundamentally the same: discover, analyze, attack and exploit. Assuming attackers will continue to find a way through, the key to reducing risk is understanding how they target and execute their attacks. Join eSentire Penetration Tester, Chuck Ben-Tzur, as he shares his experience conducting penetration tests against healthcare organizations. As cyberattacks become more frequent and more devastating, many organizations are quickly devising plans to protect against inevitable threats that could jeopardize their business. While larger organizations might have the resources to manage cybersecurity in-house, small and mid-sized organizations are increasingly faced with the dilemma of scaling up their own efforts or looking to a vendor to help them develop and execute a cybersecurity strategy. Nothing affects a law firm’s bottom line more than lost billable hours. Yet, as firms continue to focus on defending their clients in the court room, protecting client data often takes a back seat. By investing in cyber protection, firms can avoid the financial, reputational and regulatory implications of an inevitable cyber breach. In 2017, cybercriminals netted massive returns from ransomware and other crippling cyber-attacks. Healthcare is one of the top three cyber targets and faces daily business disrupting attacks. Ransomware has quickly and effectively become one of the greatest cybersecurity threats facing businesses and general users alike. According to the FBI, ransomware threat made $209M in the first quarter of 2016 and they predict that it will exceed $1B for the year. This year, successful attacks targeting law firms, financial institutions, and healthcare organizations have already netted massive returns for cybercriminals. In this webinar, we'll detail real-time ransomware cases and discuss how emerging ransomware variants will impact the legal services industry. How to prepare for SEC-OCIE requirements. The finance industry continues to be a popular target for cybercriminals, but for many small and midsized firms, cybersecurity isn’t always top of mind. Knowing what technology, skills, and expertise you need to effectively protect your confidential data is a good first step in building your strategy. Financial institutions are facing heightened cybersecurity risk and increasing pressure from regulatory agencies like the U.S. Securities and Exchange Commission (SEC). No matter the size of your firm, it’s important to ensure you have the right defenses in place. Hackers Never Take a Break. Neither Do We. eSentire® is the largest pure-play Managed Detection and Response (MDR) service provider, keeping organizations safe from constantly evolving cyber-attacks that technology alone cannot prevent. Our 24x7 Security Operations Centers (SOC) are staffed by elite security analysts who hunt, investigate and respond to known and unknown threats before they become business-disrupting events. Protecting more than $5 trillion in corporate assets, eSentire absorbs the complexity of cybersecurity, delivering enterprise-grade protection and the ability to comply with growing regulatory requirements. For more information, visit www.esentire.com and follow us on Twitter @eSentire.